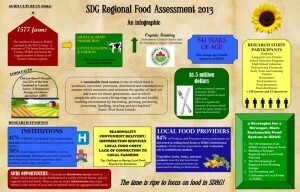 The Stormont-Dundas-Glengarry Regional Food Assessment, a compilation of seven month’s research on SDG’s food system, was recently released by The All Things Food Network. Authors Julia Stevens and Dana Kittle researched the interest of SDG institutions in purchasing local foods, and the capacity of local farmers to supply institutional demand. They also looked at gaps, challenges, and opportunities in the food system, and offer a set of four strategies to creating a stronger, more sustainable food system in SD&G. Both authors agree that “the time is ripe to focus on food in SD&G”, and hope to secure additional funding to implement the strategies outlined in the report. In the near future, All Things Food will be partnering with the Eastern Ontario Agri-Food Network to produce a 2013 Regional Foods Guide for both Stormont-Dundas-Glengarry and Prescott-Russell Counties. It is anticipated that the guide will be ready by June 2013. 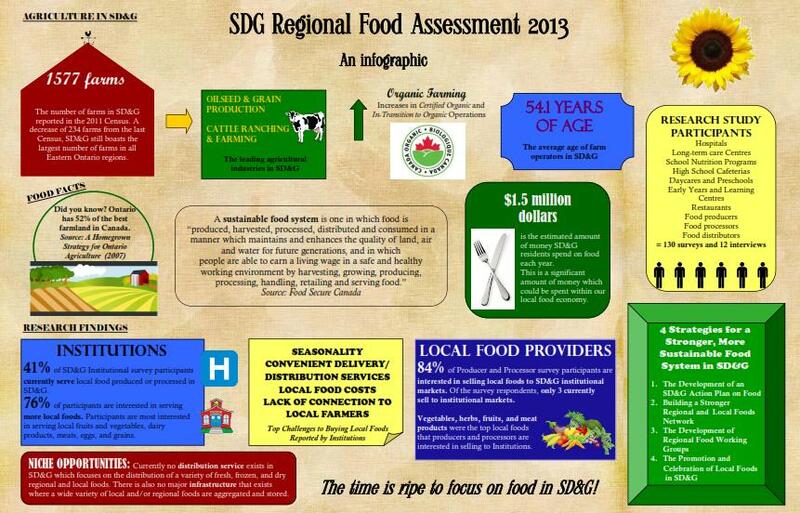 For more information about the SDG Regional Food Assessment the All Things Food Coordinator at info@allthingsfoodbouffe360.ca.